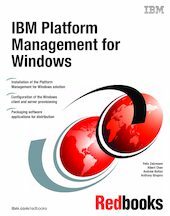 IBM Platform Management for Windows is a common Windows platform for large-scale rollout of Windows 2000 and XP to clients, and Windows 2000 and 2003 to servers. Platform Management for Windows can either be used stand-alone or tightly integrated with Systems Management frameworks such as Tivoli or Microsoft SMS. It is targeted towards customers having anything between 100 and 100,000 clients, and 5 to 500 servers. IBM Platform Management for Windows is integrated with the IBM ThinkVantage Tools such as IBM ImageUltra Builder and contains a set of additional automated deployment tools and procedures for roll out of clients, servers, and platform infrastructure components. It also includes and LDAP, or Active Directory-based data repository for customer platform parameters, and tools for Windows 2000/XP administration. Platform Management for Windows is based on innovative and truly dynamic software distribution technology (which is totally hardware-independent contrary to usual “imaging-based” methods), and inherently supports many different server, desktop, and notebook models from a wide variety of manufacturers.